Eleven students at Bradley Creek Elementary School participated in a robotics academy last fall, offered through the school’s AIG program. Bradley Creek AIG coordinator Christy Howe partnered with WCE associate professor Amy Moody on the robotics enrichment program. Moody introduced the fourth and fifth graders to Cozmos, Ozobots, and Bee Bots, and Howe helped the students use them to create standards-based lessons for students in kindergarten through second grade. The result was a series of robotics games using rhyme and alliteration activities, physics lessons, and more designed to help young children build core words and math-based fluency. 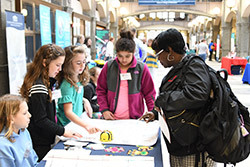 The AIG students shared their robotics games with younger kids at Bradley Creek in the fall. 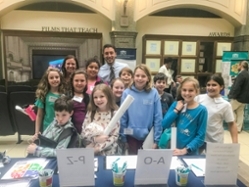 On January 4, they visited the Watson College to present their work to teachers attending the PK-12 STEM Education Conference. Participating students said they enjoyed learning about robotics, and finding ways to make learning fun for younger children. Howe is New Hanover County Schools’ 2018 Teacher of the Year. She was named Southeast Regional Teacher of the Year by the North Carolina Department of Public Instruction in December, and is one of nine teachers who will compete for the honor of State Teacher of the Year in April. Moody is an associate professor of early childhood and special education, and director of the Center for Assistive Technology at the Watson College. As a follow-up to the successful robotics academy, Moody shared UNCW’s collection of Eric Joyner robot paintings with Bradley Creek. 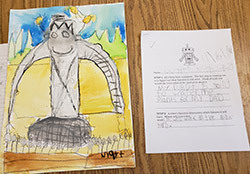 Joyner’s work was displayed in the school’s media center, and second graders analyzed and discussed the art during classes with media specialist Annette Janssen and art teacher Heidi Pfirman. Moody said she was glad to see Bradley Creek teachers introduce robots in new ways to engage students. “I was really excited to see they ran with it because the kids were excited,” she said.